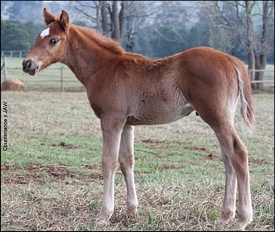 Roski Stud have welcomed their first foals for 2012 with three on the ground so far. The first crop of Just As Well’s progeny are arriving and Greg Royden-Turner, co-owner (with Anton Proctor) of this well-bred young son of A.P. Indy, has a great deal to be excited about. Just As Well stands at Spring Valley Stud in Mooi River. Greg has three newborns by Just As Well and the first thing that is noticeable is the extraordinary amount of good bone in their legs. They are good-looking, correct foals and Greg points out that Just As Well seems to be stamping his foals, in particular with a ‘snip’ marking between their nostrils. Just As Well, a good-looking bay son of A.P. Indy who shares his famous sire’s beautiful head with an excellent length of rein, is out of Gr 1 winner No Matter What by Nureyev. Just As Well is himself a four-time winner over dirt and turf, including a Gr 1 winner of the Northern Dancer Breeder’s Cup Turf Stakes over 2400m and winner of the Gr 3 Arlington Million over 2000m. He placed in five Group races, two of them Gr 1. Greg also points out the stallion has an exceptional temperament and the fact that a stallion bit is not necessary when handling him. A passionate breeder with a love and enthusiasm for horses, carried on by his daughter Juli who manages the farm, Greg says: “I have already planned my pedigrees and booked my matings for next year!” Juli – or Soss as most people know her – has inherited her parents’ love of farming and horses and it is evident in how confident and friendly their young stock are when Juli enters the paddocks. Whilst Greg handles the farming operation, his wife Shelley manages their other business, The Oasis BP Garage located between Hammarsdale and Cato Ridge. Greg emphasises the need for the breeders to support each other and has put together an arrangement of a ‘stallion-swop’ with several farms to diversify the book of mares for Just As Well and in return support several of the other exciting young stallions in KZN. With regards to the stallion swop arrangement, two extraordinary horses have been conceived by this concept: one being Secretariat, the other being our very own Dancewiththedevil. Just As Well has two half-sisters in Rainbow View (by Dynaformer), a Gr 1 winner of the Fillies Mile and Matron Stakes, and Winter View (by Thunder Gulch), a Gr 3 winner of the Bewitch Stakes and All Along Stakes. His second dam produced the likes of Gr 1 producing sire E Dubai and under the third dam another sire stands out in Raven’s Pass. Greg has sent a quality book of mares to Just As Well, the one being 23 year old mare Lydara by Alydar out of Stick To Beauty by Illustrious – herself a $US 2.2 million yearling in her day. Lydara won two races in the USA. A half-sister to USA Champion Three Year Old Sprinter Gold Beauty, Maplejinsky and Sky Beauty, she has produced five winners and visited elite stallions overseas such as Danzig and Sadler’s Wells. Her progeny have raced and won in Britain, USA, Russia and South Africa. 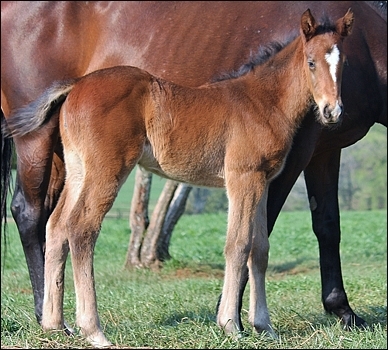 Lydara’s half-sister has produced Dayjur (the sire of Modern Day). This exceptional dam-line includes many Bold Black Types and sires, The Prime Minister, Majestic Venture and Felix The Cat. She is the dam of 2 winners in South Africa, King’s Bench and Fort Sylvia, her most expensive yearling sold being King’s Bench for R650 000. She has an equally outstanding colt by Just As Well this year – a foal with enormous character, substantial bone and good-looks. 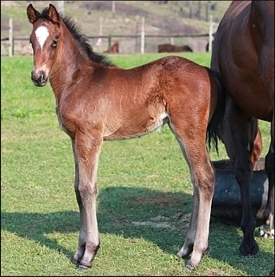 The other impressive bay foal born at Roski, by Just As Well, is out of the mare Leave ‘Em Smokin’ by The Sheik. 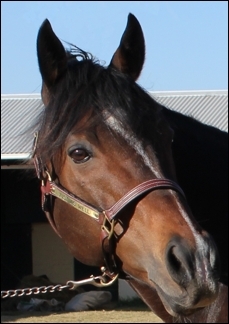 Leave ‘Em Smokin’ is out of Small Fry by Token Of Youth(USA), in turn out of a Ribofilio mare. Leave Em Smokin was a two time winner and placed four times. A half-sister to three winners, the dam-line continues with plenty of Bold Black Type including 5-time winner Sepia, Gr 1 SA Oaks winner Free Style, Gr 2 Chairmans Stakes winner Charming Harry, Elevated Charm, multiple Gr 1 winner including the July Handicap King Willow, Gr 1 SA Oaks winner Rootin’ Tootin’ and Love Is In The Air, to name but a few. Countenance (by Counter Action out of Fair Isabella by Cordoba) is a seven-time winner, including placing in the Gr 2 Odessa Stud Fillies Championship. She has produced a lovely chestnut colt, a youngster with plenty of quality and presence this season by Just As Well. Countenance has produced two winners to date and her dam-line includes Act Of Supremeacy, Gr 3 winner Block And Chisel, Spey Bridge Champion Three Year Old Colt Match Winner, Hunter’s Moon and sire Centre Court. Greg has acquired an exceptional broodmare band over the years, with shrewd purchasing and a bit of luck involved. He has a number of imported mares by Singspiel, Royal Academy, Gulch, Fastnet Rock and Rainbow Quest amongst many others, a lovely big dark-bay mare by Jet Master and Rambo’s Love. One broodmare that is an exciting stand-out is a half-sister to our very own champion sire, Kahal, which Greg imported from Ireland and raced successfully before sending her to stud. Katici Princess (by Noverre) won five times in South Africa, including the Gr 3 Champagne Stakes. She has an impressive yearling colt at Nutfield Farm by Captain Al. Showing the yearling colts and fillies he has earmarked for the National Sales next year, they are all impressive youngsters with boastful pedigrees as well as being big, strong and well-grown – it is indeed exciting times at Roski Stud and Greg’s sale’s draft of KZN-breds for next year will undoubtedly catch the attention of buyers – with sires such as Kahal, Var, Captain Al, Mambo In Seattle, KZN-bred Jet Master, Fort Wood, Dynasty and Western Winter amongst the mix. Greg recently attended the Michael Holmes Bloodstock Dispersal Sale of the Late Roy Eckstein and Mr and Mrs RC Muir. Greg purchased an Australian mare Harbour Light (Thunder Gulch – Gaslight by Theatrical and out of a Secretariat mare), a six-time Stakes placed winner for R90 000 as well as four-year old daughter of Jallad, Tempted. She is out of Argentine mare Tempter, by Southern Halo for R160 000. The filly has had two wins including The Debutante Gr 2 and placing twice, both fitting editions for Roski Stud. Greg commented that he had a very successful National Sale this year, averaging R249 000 per horse with the top-seller being by Trippi out of Rambo’s Love for R900 000. A young stud farm, Roski Stud will be one to watch in the near future!